Pie - it's not just for dessert! I had never had a meat pie before, but I've been wanting to make one for a long time now. What is there not to love about a flaky crust filled with meat and veggies? Then I decided that this past weekend was the perfect opportunity to make some little hand pies for the Season 2 premiere of Game of Thrones. Those folks love themselves some meat pies! 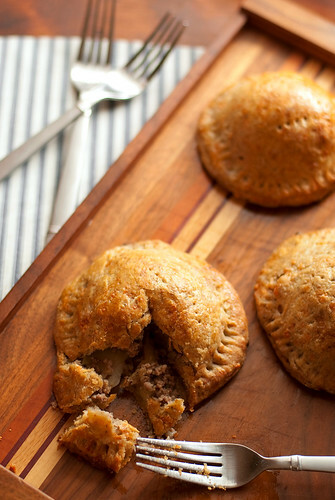 I've had this recipe on my "to make" list for months now, so I decided to adapt it to make these hand pies. Maybe it's not authentic Game of Thrones fare, but they sure were delicious. The crust is exceptionally good and flaky with a hint of cheddar. The spices in the pork paired with the apples hints at sweetness without overdoing it. It all comes together into the perfect savory, sweet, cheesy, buttery bite. Trust me, you need to make these. I love them as hand pies because they're cute! and easy to share, but you could certainly make this in a regular pie dish if you prefer. 1. To make the crust, add the flours, sage, salt, cold cubed butter and cheese to the bowl of a food processor (you can do this by hand if you prefer of course.) Pulse the mixture about 5 times, or until the butter is cut into pieces the size of large peas. Drizzle in 6 Tbsp of water and pulse a few times, adding more water 1 Tbsp at a time if needed just until the dough holds together when you pinch it. Don't overdo it with the food processor - you want to see small chunks of butter in the flour. Turn the dough out onto a lightly floured surface and knead a couple times until it holds together. Flatten it into a disk, wrap in plastic wrap and refrigerate for at least 30 minuts. 2. Meanwhile, to make the filling, heat a large pan over medium low heat and saute the apples just until the soften ever so slightly, about 5 minutes. Transfer to a bowl and set aside. Add the oil to the pan, increase the heat to medium-high and add the onion. Cook for a minute or two and then add the pork, sugar, salt, pepper and spices. cook the pork mixture until no longer pink, using a spoon or potato masher to break up the meat, about 10 minutes. Allow to cool for 10 minutes and then transfer to the bowl of a food processor. Add the breadcrumbs to the pork and pulse 5 times, or until the the pork is broken up and well mixed. Set this aside while you prepare the crust. 4. Arrange the smaller circles a couple inches apart onto a non stick baking sheet, or line a sheet with parchment paper. Arrange two layers of sliced apples on each circle, leaving about a 1/4 inch border all around the edges. Place a 1/6th of the pork mixture (about a good handful) in a mound on top of the apples. Don't be afraid to really pack it on there. Drape the larger circles over the pork and tightly pinch the edges together and seal by pressing a fork all around the edges. Lightly brush each pie with the egg wash mixture. Bake for 20-25 minutes, or until the crust is golden brown. Let cool for 5-10 minutes and dig in! Ooooooh... Delicious! Thank you so much for sharing, I bookmarked this for a perfect rainy day.